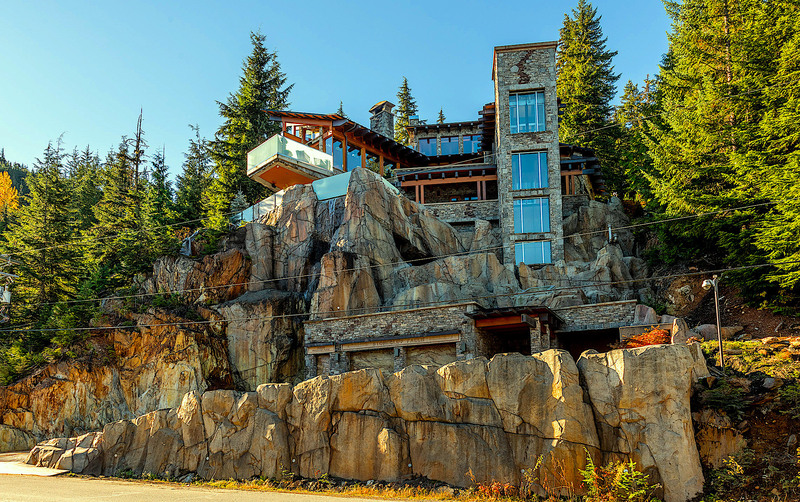 One of the most unique homes in Canada on the market right now is easily the Stonecliff Falls chalet in Whistler, BC. This chalet offers a blend of contemporary stylings with a lot of rustic west coast thrown in, but its rock facade is what steals the show. There’s nothing else quite like Stonecliff Falls in Whistler, or the rest of Canada or that matter. It sits outside of the main Whistler Village and is said to be the most photographed home in Whistler. Stonecliff Falls has that name for a reason and that is, well quite obvious as it’s built atop a cliff. There’s not a neighbour around this property, the views are jaw-dropping and this home is accessed via an elevator. There are so many different spaces and rooms in here it’s hard to capture it all in one post. I however will focus on the beauty of the views, the brilliant use of exposed beams everywhere and of course all those windows for natural light. Stonecliff Falls has just over 4,700 square feet of living space and that packs in four bedrooms and six bath. This home has it all including ski-in access, over 2,000 square feet of outdoor space and all the features a luxury home should have. It’s now listed for a cool $8,998,000 CAD with Viive M. Truu and if you’d like to learn more give them a shout via vtruu@sutton.com today. Sorry as I cannot find out any contact information for this Realtor, if it’s a he or she and or any phone number…not sure how they got the listing being a ghost but best of luck!